January is theatre-fest time: there’s the always exciting COIL fest, Under the Radar at the Public Theater, and the opera-centric summit Prototype. But Theresa Buchheister– a founding member of Title:Point, the DIY production company that runs Vital Joint at the Silent Barn– thought it was the perfect opportunity to introduce her own operation into the mix, The Exponential Festival, as a counterpoint to the usual. Would you rather spend a short evening watching stuff in a bar or dedicate your whole day to the wildest and most visceral of performance art? This week, you can do both. At Bizarre Bushwick, 12 Jefferson Street, Bushwick. 9pm; $7-20 suggested donation. More info here. 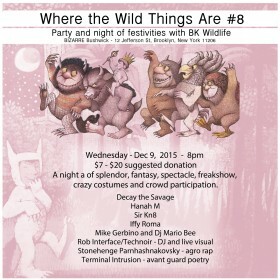 Party moguls Brooklyn Wildlife present the eighth edition of their evening variety show at Bizarre Bar, home to all shapes and sizes of variety show. At any given moment, you can catch “aggro” raps by Stonehenge Parnhashnakovsky, beats by Star Falcon and Rob Interface, performance art poetry by Terminal Intrusion (Nyssa Frank, owner of The Living Gallery), burlesque, and more. The event asks attendees to wear a costume from a childhood story, a mascot outfit, or just to come half naked. So, suit up. Or down. It’s December. Instead of thinking about how time is quickly passing you by, take a pause from reality and step into one of the many intriguing performances available this week. Some of them are even free. Greenpoint artist Allison Sommers is once again gathering the most unconventional art from 30 local artists for a popup art show called The Happening, held this year at Cloud City. Tomorrow the Williamsburg art space, founded in 2013 from the ashes of Dead Herring, will be overrun with artists hanging their work and preparing music and dance performances. It promises to be unlike anything you would find at a traditional gallery. You might remember a show space in Williamsburg called Dead Herring. It was around for six years — practically decades in DIY years — before it closed in 2013. “I knew it wouldn’t last forever,” Nicki Ishmael admitted. “It’s that whole DIY has-an-expiration-date thing.” But it’s a wonder Nicki can keep it together when reminiscing. DIY’s the only home she’s ever had in New York City. From the moment she arrived here Ishmael has been deeply involved in the underground music scene. “I immediately moved into a DIY space when I moved here back in 2006,” she recalled. So it’s only natural that Ishmael and others from Dead Herring refused to let their own closure, and dozens more around them, get them down.